"A tree can be defined as a plant that, when undisturbed, develops a single, erect woody trunk. A shrub, on the other hand, is a woody plant that, when undisturbed, branches spontaneously at or below ground level to produce multiple stems." Due to its growth form, a tree generally is taller than a shrub. However, many trees can grow as shrubs under certain environmental conditions. An important growth characteristic of shrubs is their ability to resprout from the base when cut or damaged. Oaks also have this characteristic and may grow as shrubs (sometimes called “oak grubs”) for periods of time before turning into trees. Fire top-kills shrubs so that with frequent fire they do not grow to substantial size. If fire is removed, shrubs may develop to large size, often forming patches or clones which shade out grasses and forbs. 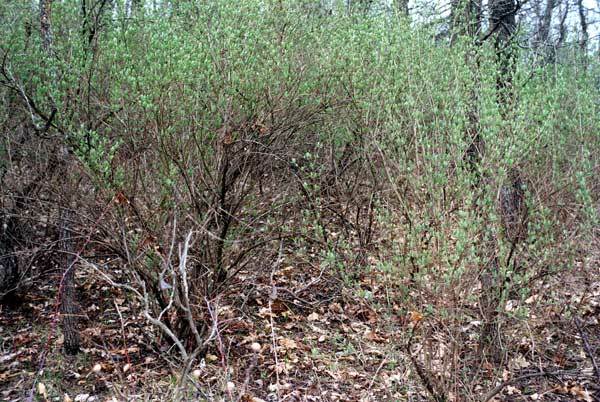 In the absence of fire for extended periods of time, large shrub layers generally develop and dominate the understory. Shrubs in oak savannas may be either native or exotic (see Table below). 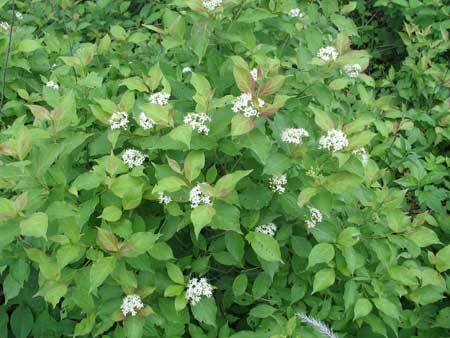 Both the native and exotic shrubs may be invasive, spreading by underground rhizomes. Often, clonal growth can lead to the production of very large patches which shade out all other understory plants. Although most exotic shrubs do not have a rhizomatous growth form, they often have other “devices” for insuring their dominance in the understory. Buckthorn and honeysuckle are especially noteworthy for their high degree of invasiveness. The early land surveyors occasionally noted the presence of hazel (Corylus americana) as part of the undergrowth. This shrub was possibly singled out for comment because of its potential economic value. One of the major tasks in restoring an oak savanna is the removal of the shrub layer. 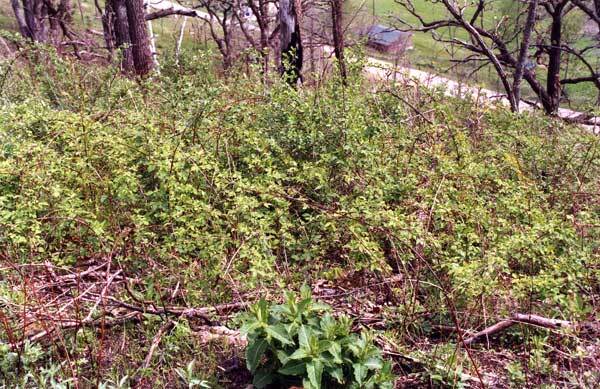 Often this involves removal of exotic species such as honeysuckle or buckthorn, but if the herbaceous groundlayer is to be restored, removal of native shrubs is also necessary. Brambles, which are native, are often a major headache in recently restored savannas. Even if they are not present in significant amount before restoration is begun, they generally develop extensively as a result of increased light to the forest floor after the canopy has been opened. Some characteristics of the shrub layer of degraded savannas are given here. Techniques for dealing with invasive shrubs are covered separately. Table. Characteristics of the native and nonnative shrubs often found in degraded oak savannas. Species with clonal growth present special problems during the restoration process. Corylus americana Hazelnut Native ?? Rhamnus cathartica Smooth buckthorn Nonnative ?? Rhamnus frangula Glossy buckthorn Nonnative ?? Honeysuckle, a common infestation in a degraded savanna. These bushes are just budding out in early spring. When in full leaf, very little light reaches the ground, so that the understory is completely suppressed. Most degraded savannas suffer from extensive shrub growth over long periods of time. One consequence is that the shrubs have been flowering and setting seed for many years, making major contributions to the "seed bank". As long as the shrubs are present, the understory is so shady that most any seeds that germinate quickly die out. However, once the shrubs (as well as any overlying trees) are removed, the light conditions at the ground level are changed drastically. Now, shrub seedlings can flourish. Whereas there may have been a few large shrubs present before restoration, there now may be dozens if not hundreds of shrub seedlings, each of which has the potential to form a new plant. 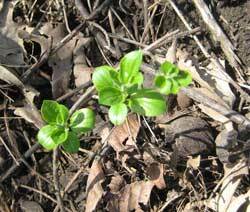 Buckthorn seedlings thriving in a savanna area that had been cleared of large buckthorn plants. The oak leaves give an idea of scale. In a restored area such as this, very large numbers of seedlings are possible. At the stage shown here, use of herbicide works very well and causes very little damage to native plants. As a result of savanna restoration, the groundlayer is opened up to sunlight. With any significant seed bank, infestation by shrub seedlings, either native or nonnative, is virtually assured. Brambles are a notorious problem when any woodland is opened up by cutting. Commercial loggers simply cut and leave, but savanna restorationists must remain to control all the new growth. Fire top-kills but does not eradicate. Bramble patch (black raspberries, Rubus occidentalis) that developed after a savanna was opened up to sunlight. The Rubus seed bank has a notoriously long life in the soil. Gray dogwood (Cornus racemosa), an attractive shrub which is a favorite of birds and butterflies. Unfortunately, it is also fiercely clonal and has the potential for making very large patches which shade out all understory plants. It is best to keep a few dogwood clones for the wildlife and eradicate all the rest. Techniques for dealing with invasive shrubs are covered separately. Del Tredici, Peter. 2001. Sprouting in temperate trees: A morphological and ecological review. Botanical Review 67: 121-140.